And I wanted to upgrade my whole lab environment to it and I haven’t set up auto-deploy or update manager yet (I plan to, making all of this much easier to manage). So I wrote a quick and dirty PowerCLI script that updates to the latest patch and if the host doesn’t have any VMs on it, puts it into maintenance mode and reboots it. I will reboot the other ones as needed. It means that you now get virtual disk granularity of VMs for not only data services on the array, like snapshots, and clones – but you also get virtual disk granularity for replication. You’re no longer forced to snapshot/clone/replicate entire datastores, or dealing with pesky, slow SCSI bus rescans and even more painful datastore resignature operations. However, there’s good news on that front! VMware will support SCSI-3 reservations on VVols starting with version 6.7, which is in beta right now from VMware. 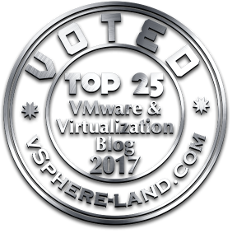 Go ahead and read Eric Seibert’s blog post on VVols futures for more information on that. At that point, I don’t want any of you even mentioning VMFS to me, unless you’re running a version of vSphere prior to 6.5 (which is our requirement for VVols). But quite honestly, VVols is a pretty compelling reason to upgrade to 6.5, or 6.7 when it comes out!